With this week’s announcement of the forthcoming Watchmen Prequels came a wide variety of reactions from fans. Our own J.P. perhaps said it best in Everything is Eventual, a solid look at this bombshell announcement; but not everyone took the news with such grace and objectivity. Our Twitter feed has been inundated with funny and insightful fan responses to the news from DC Comics. @johnnydavisesq: What no comics fan ever wanted! The #watchmen prequels are here! @asunnydayinhell: well once again the simpsons predict the future…. @DanSlott: The REAL “Before Watchmen” comic would show pages of Alan Moore reading stacks of Charlton Comics, watching an Outer Limits ep. @AlphaInvictus: …The first #Watchmen wasn’t *that* great. Maybe they can put some#effort into this one. 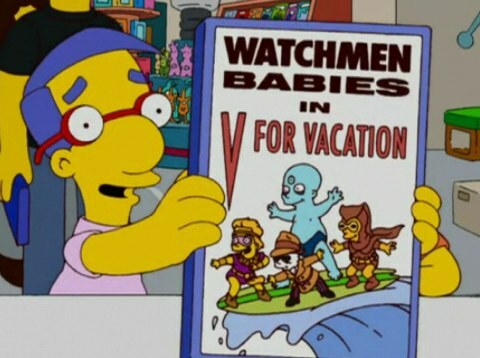 Have you seen any awesome zingers or thoughtful comments about the Watchmen Prequels? Share it with us in the comments or tweet us: @BiffBamPop ! i’ve never been namedropped on a website. Glad my snark has earned me a place in internet history.